Surya Namaskar, an age-old yogic practice, is a comprehensive exercise, which contributes to mental, emotional, physical, and spiritual well-being. The namaskar is an obeisance to the Sun God or Surya. Surya namaskar is normally performed early in the morning, at daybreak, or in the evening, when the sun is setting. It is accompanied by a specific breathing pattern and chanting of mantras. • There are 3 forms of surya namaskar. Surya namaskar A and B are fast-paced and part of Ashtanga yoga. 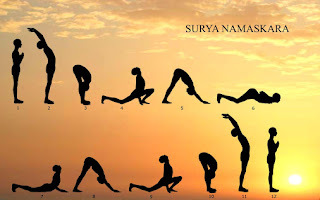 • Surya namaskar A - This form of yoga comprises 11 steps, to be performed with each leg. • Surya namaskar B - This form of yoga comprises 19 steps, to be performed with each leg. This form of exercise is characterized by a warrior pose. • Surya namaskar C - This traditional form of yoga comprises of 12 steps, which is performed with each leg. There are 12 basic steps of surya namaskar. These steps vary with different types of surya namaskars. The following steps, specific to type C, are performed at a slow pace. Stand in an erect position, facing the sun, with palms folded near the chest in namaskar. Keep the feet together and breathe normally. Breathe in, raise the arms upward, and bend backwards with the face pointing upwards and towards the sky. The back should be arched while bending backwards. Inhale and stretch the left leg backwards, and balance the leg on the toes with the heel raised upwards. The right leg is bent at the knee and the head is lifted upwards to face the sky, while the hands remain stretched with the palms flush against the floor. Exhale and keeping the palms flush against the ground, the right leg is pushed back to stay parallel with the left leg. The hip is raised with the head bent downwards to face the navel. Inhale and lower the hips. The toes, knees, chest, and face touch the floor while the hips are slightly raised. Exhale and stretch arms. Lift the chest so the back arches and the head is bent backwards to face the sky. Inhale and perform as in step 2. Bring back the hands in a folded namaskar to the chest, and breathe normally as in step 1. The steps are repeated once again, using the opposite leg in steps 4 to 9. One round of surya namaskar thus consists of 24 steps. The ideal regimen requires an individual to perform 12 rounds. There are 12 mantras that accompany the surya namaskar postures, which praise the different qualities of the Sun God or Surya. When surya namaskar is performed with the chant of mantras, there is a spiritual effect providing overall well-being. One can chant them out aloud or in the mind while performing surya namaskar. Below are the mantras with their meanings.